Although the invitational race is not a pointscore race for the series, it gives crews the best dress rehearsal they can get and the perfect opportunity to test their form against the fleet The rough conditions caused carnage and havoc with the fleet while Hamlin was sporting a number of nasty grazes on his face, another US sailor was not so lucky, taken from the water in an emergency boat to a waiting ambulance. Paul Allan, crewman on Aristocrat, sustained a broken tooth and mouth injuries in a nasty capsize and was taken to hospital for precautionary checks for concussion. The relatively inexperienced Patrick Whitmarsh, his skipper and fellow crewman Chad Freitas, better known as 49er sailors, did an amazing job to steer their stricken craft back to shore with a man down in the very strong wind and rough waters. Safely on shore, Whitmarsh said he expected Allan out of hospital later in the evening and back on the water tomorrow. The Australians were not left unscathed, with veteran Trevor Barnabas’ Omega Smeg breaking a boom early in the race and hot favourite John Harris’ RAg & Famish snapping their spinnaker pole off. 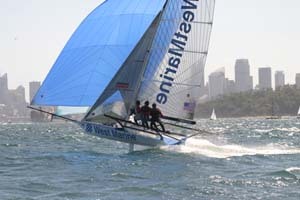 The J.J Giltinan 18 Foot Skiff International Trophy Series, the sport’s equivalent of a world championship, gets underway in earnest tomorrow with Heat 1 – Sat 3 Jan AEDST (Australian Eastern Daylight Saving Time). Continuing strong breezes are expected and Hamlin and his crew are hoping to pull out something special as they take on the Brits and the Aussies having only just pipped Greenhalgh for the title last year, they hope history will repeat itself.